How do you cope when facing life-threatening illness, family conflict, faltering relationships, old trauma, obsessive thinking, overwhelming emotion, or inevitable loss? If you re like most people, chances are you react with fear and confusion, falling back on timeworn strategies: anger, self-judgment, and addictive behaviors. Though these old, conditioned attempts to control our life may offer fleeting relief, ultimately they leave us feeling isolated and mired in pain. 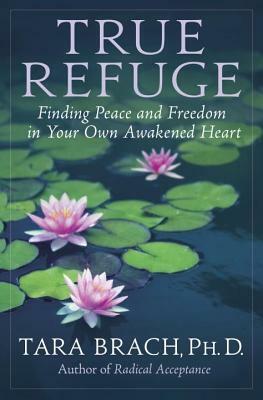 Based on a fresh interpretation of the three classic Buddhist gateways to freedom truth, love, and awareness True Refuge shows us the way not just to heal our suffering, but also to cultivate our capacity for genuine happiness. Through spiritual teachings, guided meditations, and inspirational stories of people who discovered loving presence during times of great struggle, Brach invites us to connect more deeply with our own inner life, one another, and the world around us. True Refuge is essential reading for anyone encountering hardship or crisis, anyone dedicated to a path of spiritual awakening. The book reminds us of our own innate intelligence and goodness, making possible an enduring trust in ourselves and our lives. We realize that what we seek is within us, and regardless of circumstances, there is always a way to take refuge in a healing and liberating presence.